Years ago, when I first started reading historical romances, I felt like I was getting a crash course in an exotic dialect…there were so many unfamiliar terms and phrases that at times, reading the story came second to puzzling out the meaning behind individual words. Most authors provide enough context that I got the jist of it, but I was determined to do better. I wanted to be able to smoothly read a Regency, breezing right through period jargon, and KNOW the meaning of what I read, not merely guess. Thus began a years long pursuit of compiling various Regency terms, idioms, slang, and cant–a massive undertaking made even more time consuming by the fact that I wanted my dictionary to be as accurate as possible both in definition and period–so I made the decision to stick with period resources (The 1811 Dictionary of the Vulgar Tongue, Pierce Egan’s Boxiana, and the works of Georgette Heyer). As time passed, I made the transition from Regency Reader to Writer, and discovered a new purpose for my dictionary–instead of puzzling out the meaning of a word, it also became my thesaurus. How many words could you use to denote someone as a courtesan? What were some of the more common oaths? If your characters were dealing with London’s criminal class, what was the dialect? What began as side project to enhance my reading became an invaluable resource to my writing. For those looking for a quick & delightful read, I’m pleased to announce that “The Hellfire Bride” a Regency Romance Novella set in 1827, is available at Amazon.com, Barnes & Noble.com, and Smashwords. At approx. 14,700 words, it’s a wonderful story perfect for lunchbreaks, before bed, or anytime you’ve got a few moments to spare. So, feel free to check it out, and spend a little while in a thrilling escape to a by-gone era, on a whirlwind journey of suspense, passion, and love. James Remingsdale has dedicated his life to avenging the woman he loved and lost, Melissa McLoughlin has spent most of hers in a convent until fate throws her bound and tied on a collision course with his revenge. Together, they strive to bring down some of the most scandalous & degenerate nobles in the ton, & discover that love can heal even the deepest of scars. Suspense, laughter, passion, and love fairly blaze off the page as their journey takes them from the darkest moments in their lives to the joy of finding the one who makes it whole. The wait is over. 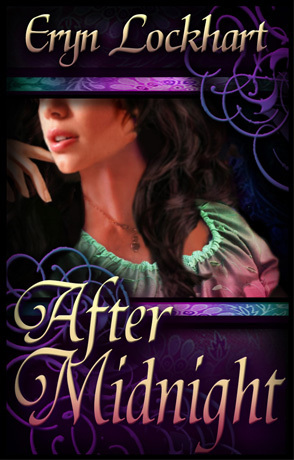 I’m thrilled to announce that After Midnight, my very first romance novel, is now available at Amazon.com, Barnes & Noble.com, and Smashwords. "Love is the Most Dangerous Game of All"
In a world plagued by Revolution and Intrigue, love is the most dangerous game of all. When Lucien Warrick’s mission to rescue a French ambassador’s family from the Revolution goes awry, he has no way of knowing that he’ll meet his lethally lovely charge again in London. A legendary shadow with godlike reputation in international intrigue, the Night Wolf is about to meet his match. As the sole support for her remaining family, Jacqueline Gervais has no time to play damsel in distress. Instead, she turns her unusual talents towards rescuing the Calvary and British artillery by spying for the Crown. A woman as skilled in deception as she is in sabotage, The Golden Hind is a creature of fatal allure and a thousand faces. A war between two nations pales in comparison to their clash of wills and passion, but when a sinister web of betrayal and deceit forces them to become mortal enemies, will the cost be their lives, or their hearts? The fate of two empires hangs in the balance, and anything is possible…After Midnight. I am a Romance author, unrepentant chocoholic, all-around movie-hound, latter-day gypsy & bookworm. I’m addicted to travel, atomic cuisine, music & corsets, and I love to dance…though no claims to expertise. In my free time I’m usually writing or reading, and I adore any excuse to get dressed up to the nines or belt out tunes in karaoke. As a die-hard romantic, I’ve always loved the romance genre. I grew up sneaking novels from my mother’s collection, then a few years down the road began writing my own. Most of my books are historical romance; I’m fascinated by the Regency period and the drama inherent in by-gone eras, though I enjoy writing Contemporaries as well. There’s something magical about crafting a tale where two people find true love. I love what I do, and I hope you enjoy reading my stories as much as I enjoyed writing them. If you want the latest, up-to-the minute news on what’s going on with me and my writing, check out my twitter feed, I’m also on facebook and Goodreads. For the full story rather than tweets, look no further than my blog. Whether your primary interest is when the next book is coming out, or what I do with my life when not chained to a keyboard, there’s a category to suit your needs. Current Events will give you the low down on my writing as well as the latest author interviews, for myself and guest writers, What’s Happening? will let you know what’s going on in my life, and if you’d like to peek at what’s currently on my nightstand, check out Book Reviews by Eryn. A labor of love is currently in review at Amazon.com; links will be forthcoming as soon as I know my novel is available in their Kindle Store. This particular story is very dear to my heart—it was the first romance novel I began writing, and the first to be finished, despite multiple breaks to work on other stories, the death of my PC (twice), 3 moves, and sundry other harrowing escapades that make it’s completion nothing short of a miracle. The main characters are a wonderful, dynamic pair who’s love proves every bit as indestructible & indomitable as their story. Set against the backdrop of the French Revolution and a war between empires, two fascinating characters are thrown together: a hardened, cynical rogue who’s years of service to the Crown have left him with a legendary reputation in international intrigue, and a spirited, valiant young lady who proves he’s met his match. It’s a thrilling and fascinatining journey, one that I hope you enjoy reading as much as I enjoyed writing.